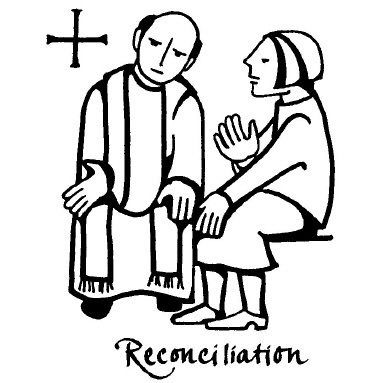 The Sacrament of Reconciliation is a unique and beautiful aspect of the Catholic Church that allows us, as sinners, to obtain forgiveness for our sins and reconcile with God and with one another. A man over on the left side of church spoke up: “It’s the examination of conscience. Unless you examine your conscience, you don’t know what you have to be sorry for and you don’t know what to confess. Anybody can see that the examination of conscience is the most important thing.” Fr. Häring wasn’t satisfied with this answer either. A young woman on the aisle tried: “It’s the penance–giving back the things you stole–unless you do the penance, it doesn’t count.” The congregation could tell by Fr. Häring’s face that he still hadn’t heard the most important thing. An uneasy silence fell over the church as people tried to think. In the silence a little girl in the third pew said: “Father, I know what’s most important. It’s what Jesus does!” Fr. Haring smiled. She had it right. In this Update, we’re going to emphasize what Jesus does for us in the Sacrament of Reconciliation. Published on Oct 3, 2016 THIS ISSUE of C21 Resources, with guest editor Kristin Heyer, draws upon the rich tradition of Catholic morality, urging that our decisions be guided by our faith community and by the voice of conscience within our hearts. To be “in good conscience,” we need to listen to both! Included are articles about Pope Francis' Culture of Encounter, the challenge of unconscious racial bias, and the work of Dorothy Day as well as an article by Daniel Berrigan, Conscience Be My Guide. The Sacrament of Penance (aka Reconciliation) is one of the healing sacraments, and celebrates the loving embrace of God when we turn toward him and away from our sins.